The following is a guest post by Shareef Defrawi. Shareef is the President of Bonafide, an inbound marketing agency in Houston, Texas. He leads a team of smart, straight-shooting, modern-day marketers who are hell-bent on growing businesses and relationships. You can also find Bonafide on Facebook and Twitter. When you work in digital marketing, you can’t escape how important a company’s brand is. At Zizinya Web Solutions, it was a part of our job every single day to help other companies develop and build their brands. We were literally in charge of guiding and shaping how other businesses defined themselves to the rest of the world, and we were good at it. That’s why it always rankled knowing our own brand didn’t quite represent our company the way it should. Zizinya started out as a web design and SEO firm, but over the years we’ve evolved into a digital marketing agency with fuller service offerings. The old brand just didn’t fit anymore. For several years now, we’ve known we needed a change. In 2015, we finally took the plunge. Zizinya Web Solutions is now Bonafide. When you know – really know, the way we did – that it’s time for your brand to undergo a change, the decision to rebrand is easy. The process of rebranding? Not so much. Expect it to be time consuming, tedious, and often overwhelming. If you’re doing it for the right reasons, though, expect it to also be extremely rewarding, as it has been for us. Here’s some of what we learned along the way. The whole point of a rebrand is coming out on the other end with a brand name, along with design and positioning, that better represents your company. So naturally, deciding what that name will be is one of the most important steps of the rebranding process. In our case, it was also the hardest. To try to pick out a new name for the company, I turned to every resource I could think of for idea generation – Wikipedia, language translation sites, and word association sites were some of the most useful in getting together a big list of ideas. Additionally, I talked to friends and family, I started researching the copyright status of some of the top contenders – I even bought a few domain names (one for $3,000 that still goes unused, no less). After spending way too much time mulling over ideas without settling on anything, I realized I was going about it all wrong. Instead of finding a cool word and trying to awkwardly make my brand fit with it, I needed to establish what I wanted my brand to say about my company and find a name to match. So, I assembled the team. To put our collective finger on what really made our company unique and valuable, we went straight to the most important source: our customers. One thing we’d heard again and again from customers is that we’re genuine. We take the time to get to know our customers. We invest in long-term relationships. We’re transparent – we’re upfront about everything they need to know, so they trust us. Once we figured that part out, narrowing down our options was much easier. After almost a year stuck in the indecision phase, holding the rest of the rebranding process up, we found our name: Bonafide. One of my biggest regrets in how we handled the rebranding process at Bonafide was not creating a plan and putting a timeline into place from day one – back before we even picked out a name. If deciding what your new brand will be is the most important step in the rebranding process, mapping out a plan is a close second. As a marketing agency, we have lots of standard processes in place for all the types of work we do for clients, so we definitely appreciate having an organized process outlined in advance. We had to create one anew for the rebrand, but it was all worth the hassle. Having a map and timeline to follow to guide us through the process proved to be invaluable. We made a point to keep a record of our process to hopefully help other businesses down the line. If you’re in the midst of a rebrand or, better yet, in the early stages of considering one, our rebranding checklist can help you organize the process more efficiently and make sure you don’t forget anything important. A small disclaimer: You should expect all the steps involved in your rebrand to take a considerable chunk of time. Most of what you have to do isn’t too difficult, but you can count on a good amount of tedious grunt work! To make time for the work of the rebrand without falling behind in our work for clients, the team at Bonafide committed to staying late once a week for a set period of time to get all the extra work done. We brought in pizza and drinks to keep it from feeling too much like work and we were sure to create an agenda in advance for each meeting, just to make sure we went in knowing exactly what needed to get done and who was in charge of doing it. We also kept a log of what we accomplished throughout the process so we could track our progress and avoid replicating any work. It worked. We knocked out almost all of the work required for the rebrand in those evenings and managed to keep everything well organized as we went. Whether most of your company’s transactions happen online or off, 61% of internet users research products online. As such, how your business looks online and how easily people can find you need to be top considerations during your rebrand. For anyone that finds you online, your web design is the face of your company. You need a design that reflects how you want your brand to be seen. Since web design is one of the services Bonafide offers, we were able to tackle this part of the process in house. If you don’t have an in-house web design team, this is one step you should hire out to a marketing agency with a reputation for good work. It’s too important to skimp on. Where you rank in the search engines is the most important indicator of how easy you are to find online. If you’ve been working to build up your SEO rankings, switching over to a new domain probably sounds like the last thing you’d want to do. Luckily, Google actually makes it possible to switch over without too much risk to your current rankings, as long as you take a few key steps to secure your place. Take advantage of Google’s change-of-address feature. Set up 301 redirects from your old site to your new one– from all your old pages to the most relevant new ones. Find opportunities to mention your old and new names close together to signal their connection to the search engines. For example, we dropped variations of Bonafide (formerly Zizinya Web Solutions) into different spots on the new website and anywhere else on the web we could. Update your company’s directory listings. Identify the links and brand mentions of your old brand on the web and reach out to the sites they’re on to request an update. The process takes some time, but as long as you do the work, you can make the transition to a new domain name without losing traffic or rankings. All of the main B2B social media platforms make it possible for you to change the name on the profiles you already have, so you don’t have to worry about losing any followers. However, you do need to take the time to research the particulars of how to update each social media profile before you do anything rash. A few of the platforms place a limit on how many times you can change your name, so if you make a move too hastily and do something wrong, you may not be able to fix it later. The amount of time and work involved in updating the different social platforms varies. For some you’ll want to get started well in advance of the day you launch your new brand, but for others you can get by with making the change on the day you announce. You probably don’t realize how many branded physical items you have around until it’s time to change them all. While you wouldn’t face any serious consequences for having old stationary around that still has your old brand name and logo on it, if you really want everyone in the office to start internalizing the change, you should update as much as possible by the time you announce. Sales and marketing collateral (PowerPoints, brochures, flyers, sales sheets, etc). You’ll also need to contact the post office to let them know about the name change, as well as everybody you do business with from your clients to your bank to your utilities company. Our rebranding checklist walks you through all the many steps and updates you need to be sure to complete, so you don’t risk missing anything important. A rebrand is a great opportunity to step up your promotion efforts. While you should always be working to promote your brand, something as extraordinary as a rebrand gives you some extra oomph to work with in getting your name out there. Every professional contact you have should get an update – your clients, your vendors, your suppliers, your networking buddies and anyone else you can think of. Work up an informative email that announces the rebrand and explains what people can expect from the new brand. You might find it useful to write a few versions of your launch email and tailor each version to one of the different groups you want to tell (one meant for current customers, another for the rest of your email list, one for vendors you work with, etc.). Any time your business has something newsworthy to announce, a press release is in order, and a rebrand definitely counts as newsworthy. Write a press release that shares the story of your new brand and use a PR distribution platform to make sure it gets to a wide audience. Ideally, your release will be picked up by a few different sites, so it’s a great opportunity to get your new name out there. Social media gives you a direct connection to many of the people who already care about your brand. Make sure someone at your company is committed to spending time monitoring your social media channels in the days after the rebrand so you can respond quickly and thoughtfully to any feedback and engagement you get. On both social media and search, paid ads can be worth the investment to raise awareness of your new brand name. For your PPC ads, you should consider bidding on keywords related to your old brand name for a while after the change. That way, you can continue to capture the traffic from people who are still looking for your former brand. To raise the profile of your new brand, seek out relevant blogs where you can share your expertise and gain some new followers. People will start to associate your new brand name with the credibility of your guest blog posts and hopefully relevant audiences will find their way back to your site. Giving presentations at local events or conferences can serve the same purpose as guest posts – it gets your new brand name out there in a way that ensures people will associate it with your knowledge and expertise. As an added benefit, you’ll make new connections that could turn into valuable contacts and leads. If they’re sufficiently impressed, they may even help spread the word of your new brand! We know that’s a lot to take in. A rebrand is a serious undertaking. For us at Bonafide though, the work was worth it in the end. All of the responses we received from customers and other contacts were positive and we didn’t experience any dips in traffic or social following. Most importantly, though, we finally feel we have a brand that truly represents our company and our people. 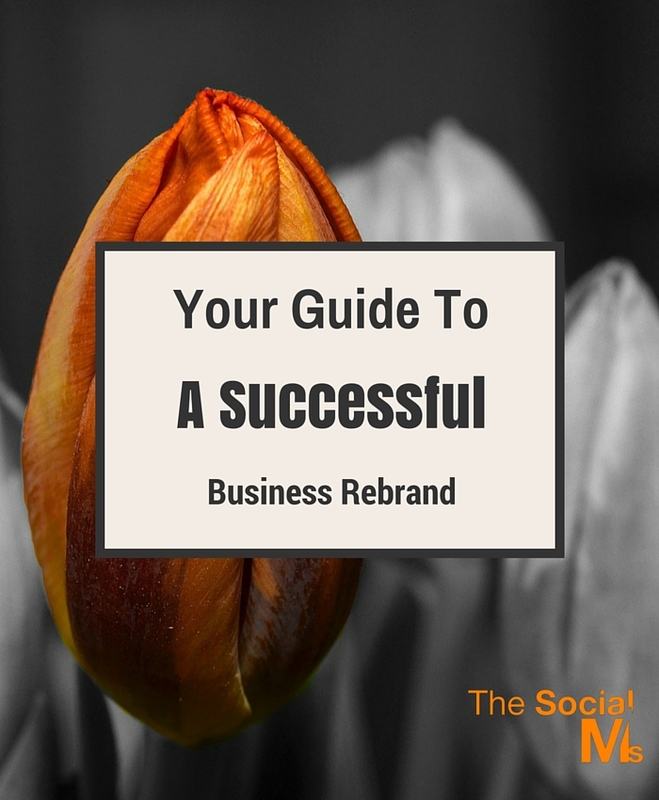 That should all give you a good start on knowing what to expect for a rebrand and making a plan. Along the way, we found a lot of resources that helped us through the process. Mightybytes – Will Rebranding Hurt SEO?